"Hillary and Clinton," by Lucas Hnath, author of "A Doll's House, Part 2," is slated to open on Broadway in spring 2019. This combination file photo shows John Lithgow at the world premiere of "The Accountant" in Los Angeles on Oct. 10, 2016, left, and Laurie Metcalf at the Tony Awards in New York on June 10, 2018. 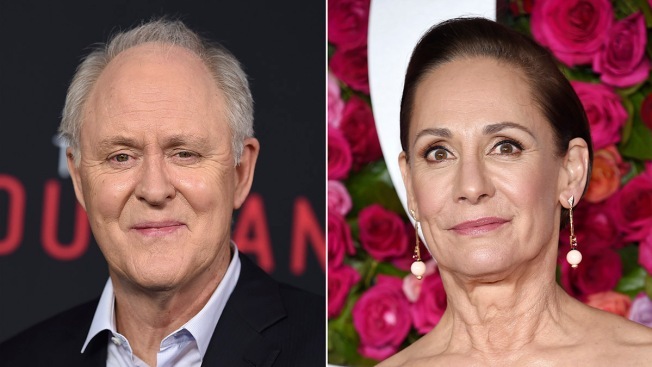 "Roseanne" star Laurie Metcalf and John Lithgow of "The Crown" are poised to star as Hillary Clinton and former President Bill Clinton in a new Broadway play. "Hillary and Clinton," by Lucas Hnath, author of "A Doll's House, Part 2," is slated to open on Broadway in spring 2019. The play is set in New Hampshire during the early days of 2008 as Hillary Clinton tries to save her troubled campaign for president. Two-time Tony winner Metcalf played a Hillary Clinton supporter in the "Roseanne" reboot earlier this year and continues her role as Jackie on the spinoff, "The Conners." Two-time Tony winner Lithgow has had notable turns on "Dexter" and "3rd Rock From the Sun."